Koblenz, lies where the Rhine and the Mosel river flow into each other, and its name is derived from the Latin "confluentes flumines" (=joining rivers). In 1992 this city celebrated its 2000th anniversary. Its settlement history however dates far further back, supported by findings from the Stone Age around the city area even before 200 B.C.. Similar findings are dated to the Bronze (2000-800 B.C.) and Iron Age (800-50 B.C.). Indeed, Koblenz is very well situated at the southern end of the Neuwied Bay, where the narrow Rhine valley opens into a vast area of fertile lowland. When the Gauls were conquered by Roman troops under Caesar (58-51 B.C.) the Celtic tribe of the Treverers lived at the Middle Rhine and Mosel. They had a very sophisticated tax and finance system, with economic systems based on labour division and a variety of craftsmanships. In contrast to the adjacent Hunsrück they had much fertile ground, which was good for agriculture. Whilst the occupation by Roman troops(often enforced in a violent and bloody manner) caused frequent riots,Koblenz nevertheless entered an era of economic growth and prosperity. Despite initial hesitance and a period of necessary consolidation the Roman settlement was firmly established at the start of the 1st century AD. This resulted in the building of the Mosel bridge and the first bridge to cross the Rhine in 49 AD. The well constructed secure street connections over the Hunsrück to Mainz, Trier and Cologne resulted in enormous economic growth, further encouraged by the erection of the Limes. The Roman Occupation only ended in 402 AD with the conquest of the region by the Alemanni and Franconians, and with the retreat of Roman troops from the Koblenz Fort. This led to a major crisis which lasted for centuries, and was only resolved in the High Middle Age, with the elevation of Koblenz to Federal city of the Electorate of Trier. A market place was built and building works continued establishing Koblenz as a city for shipping trade of mass production. In this way the city developed into an important economic location, and its growth continues up to the present day. Koblenz, with the massive fortress Ehrenbreitstein on the right bank of the Rhine, is the gateway to the Hunsrück, Eifel and Westerwald areas. The Deutsche Eck, where the Mosel flows into the Rhine, goes back to a German order that settled there in the early 13th century. There is a monument to Kaiser Wilhelm I to remind us of the era of the Prussian totalitarian state in German history. There was a longstanding debate about whether or not the statue of the horseman, which was destroyed in World War II, should be restored. A private foundation wished to do this and finally, in 1993, the monument was unveiled at the German Corner during a public celebration complete with rock music (instead of marching music and cannon fire). The same patron and art historian is also responsible for the Ludwig Museum of French modern art with its changing exhibitions of current French art at the historical "Deutschherrenhaus". This city was moulded by European history and culture and a walk across the Balduin bridge to the other side of the Mosel with its view of the old city and the Fort Ehrenbreitstein on the other side of the Rhine is well worth taking. The Balduin bridge was completed in 1363 and 11 of its 20 original arches still remain. 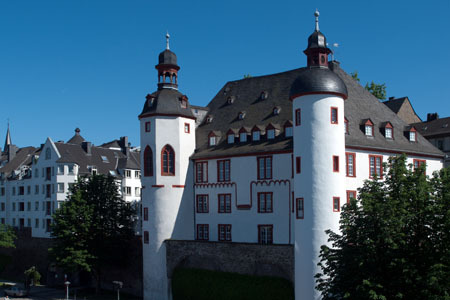 The "old castle" (1277) stands close to the bridge Now the city library it used to be a residence for the Elector. From here the path leads through the Florins market with its late gothic "old shopping mall", the historic "Schöffenhaus", the "Nürresheimer Hof" and the monastery Church of St. Florin (dating from 1100) to the Liebfrauen City Parish Church (first mentioned in 1277). This city Parish Church is located on the highest point of the old city, and its foundations go back to the 5th and 6th centuries. However, the current form of the building dates from the second half of the 12th century. The oldest church is the former monastery Church and Basilica St. Castor, a three-nave hall church with two massive west towers started in 817 and sanctified 19 years later. Other worthwhile diversions are to the New Castle (1777-1787) and a boat ride over to the elector's residence below the fortress Ehrenbreitstein on the other side of the Rhine. The Beethoven family home is also located here.